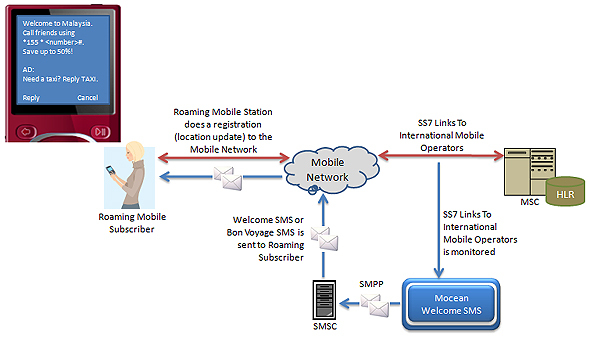 Mocean Welcome SMS solution is a non-intrusive system that monitors the SS7 links and checks for SS7 messages in the network indicating visiting roaming subscribers or outgoing roaming subscribers registering into the mobile network (usually as they turn on their mobile for the first time). Upon detection, Mocean Welcome SMS solution will then check for relevant messages in the message database to send to the subscriber. In the event that the Mobile Operator already have a SS7 Monitoring Probe, Mocean Welcome SMS system can also interface with the probe via APIs. This would allow Mobile Operators to maintain low expenditure by reusing existing systems. These welcome messages can be service usage guides, informational messages or promotional adverts. The messages can easily be configured and created on the system with flexible features such as Message Grouping, Scheduled Messaging & Dynamic Message Rotation. Messages are sent via the Mobile Operator’s SMSC using TCP/IP protocol (SMPP) or if required, the system can also send the message to the subscriber via SS7 signalling. Advertisement Text Inserts with Mobile Advertisement capabilities can also be enabled within the system, providing additional revenue generation channel. Mocean Welcome SMS system provides Mobile Operator the complete messaging solution to communicate with roaming subscribers.